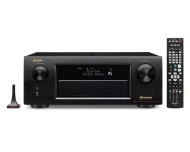 alaTest has collected and analyzed 47 reviews of Denon AVR-X5200W. The average rating for this product is 4.2/5, compared to an average rating of 4.7/5 for other products in the same category for all reviews. We analyzed user and expert ratings, product age and more factors. Compared to other products in the same category the Denon AVR-X5200W is awarded an overall alaScore™ of 91/100 = Excellent quality. Review: The Denon AVR-X5200W 9.2 Channel Dolby Atmos AV receiver features a fully assignable amp section rated at 140 watts/ch x 9. We evaluate in a full Dolby Atmos 5.1.4 speaker configuration. Outstanding audio capabilities and thoughtful ergonomics underpin our first Dolby Atmos-capable AV receiver.